A small brown dog and a heap of metal inspired Joshua Welton. How did an old blue metal box become a Blue Chrysler Desoto? Josh, I read that you started your art at Chrysler. How did that happen? Although I have a couple of brothers who are trained artists, it was never my goal. But when I got to Chrysler, welding was a part which I really loved. I did my apprenticeship there and got a really cool background in lots of types of welding. All the spare time I had, I was in the workshop putting things together. At first it was craft and not necessarily art but it kept evolving and before too long, I became passionate about creating sculptures. Have you turned it into a full time job now? I put full time hours into it and I also work for General Dynamics Land Systems in their proto shop. So I build military type vehicles and prototype parts for defence industry. I work a lot but it's my passion. It's what I love to do. The past couple of years I've had a series of arm surgeries which has put a kink in things. I probably would be off on my own doing my art, if it wasn't for the health issues. I love the way you describe your passion for welding. I read your Facebook posting about the welding done on the Monster Truck. Yes, I got a lot of flack for that from the Monster Truck community. It was cool though because one of the guys who works at the shop where they build those trucks, was a little bit offended in the beginning. But then we got talking, and he said they need to step up their quality. So maybe something good came out of that in the end. I liked it though because it showed your passion for high quality and craftsmanship. You made a reference to your background, and your work for the defence industry. I don't do that to brag but I want people to realize that I know what I am talking about. I am not just pulling something out and trying to shame anybody, without actually having a background in it. I think some people got the impression that I was just some guy who didn't really know what he is talking about. But at some point, your experience gives you some credibility. I have been through the certification and have seen what can happen if it's not done right and it can be disastrous. I can relate to that because I have a background as a precision mechanic in engineering. Somewhere in space there is a satellite with a little part in it which I created. That's awesome. My Grandfather actually had some patents on something that was on Mars or one of the Lunar Rovers, and he would talk about that with a sense of pride because he had some part in doing something which potentially changed the course of human history. It's pretty crazy. You have a variety of topics, one of which is cars. How do you pick your topics Josh? It's hard to be in Detroit and not have cars seep into your blood stream. Even before I moved here, I was always into cars and had a Camaro Z28. My Grandfather had an old Buick which I now own and am customizing to be a world trip vehicle. 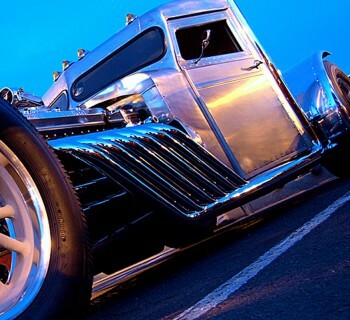 I didn't necessarily grow up to be a hot rod guy. I just like the design aesthetics, even more than the function. I've just always liked things which look cool. That is to me part of the industrial designer stuff. Brutal machines that look cool. Like the old school hot rods which are just bare bones. The guys who were coming back from the war in the 40's were building the choppers and the hot rods. They just basically took everything apart that didn't make it go faster and that was what they drove. It gives off a cool aura. Does that describe your style a bit? One side some aesthetics and the other, the mechanics and the raw part of it? Yes, I don't like it when my work is referred to as a model or replica. It might be semantics but I try to give more essence of what the vehicle is. Actually one of the best compliments I got, was from my friend Tom Fritz. I had done this 48 Buick and he had seen it online but he wanted to see it in person. He came up and said 'You've captured the essence of what these vehicles were'. They are not perfect proportions. You can do something to scale and they never quite look right. You've just got to capture the feel more than anything. I think that's where the art comes from. Perfection is boring. Anyone can computer scan something to be perfect but you have to figure out where to leave things out and where to add things, to make something have that wow factor. Tom Fritz is someone I respect so much, so it was so nice of him to take the time to say that. I met Tom a few years ago when he gave me some advice. He saw what I was doing and wanted to push me further. It's a great motivating factor when someone like Tom Fritz takes an interest in what you are doing. So do you have a scrap heap behind your house Josh? Pretty much. People found out what I do and offer me scrap metal left and right. So I started collecting it. My shop is pretty much full of old metal. If I do a commission piece, I usually have the person send me a bunch of pictures of their hot rod or their bike or whatever it is. I tape them up on the board, so that I can see them. Sometimes I sketch it out from three different views, so that I have an idea of the proportions. It's not usually something I stick to but it gives me an idea. If I do something out of my head, I just put stuff together until it looks right. That's the nice thing about metal, you can pull it apart and add it. I throw all the stuff together and if I have to take it apart, I take it apart. Usually though, what I have in my head comes out pretty good in my hands. Is it almost like clay? Yes, a famous sculpturer once said "the model is inside the stone. I just have to chip away at it until it shows up". I kind of do the opposite. The sculpture is in the metal somewhere. I've just got to keep at it until it looks right. Kind of the opposite to carving stone but pretty similar to clay I suppose. Putting it together and then shaping it exactly to what you want. And that's something I have fun with, using industrial material. I started using old sheet metal. Like the 48 Buick I did. That was with sheet metal door skins off of a 68 Satellite. At one time it was stamped out and used as something very utilitarian. Now I am taking it and recycling it into an art form which represents that motor transportation in a different way. I like working with metal. One thing which bugs me about a lot of fine artists who use metal as material, is that they learn just enough about welding or cutting or grinding to make their vision become a reality. When I got started at the Detroit Institute of Art, there was this stainless steel sculpture there which was huge and the welds were just atrocious. I thought to myself 'I might have a great concept for painting or a drawing but I can't paint and I can't draw. So I'm not going to try it. Why do these people think they can create a metal sculpture without having mastered the basic welding techniques then?". Something I try to bring to my metal art, is having the technique done first and then being able to translate it into my art. 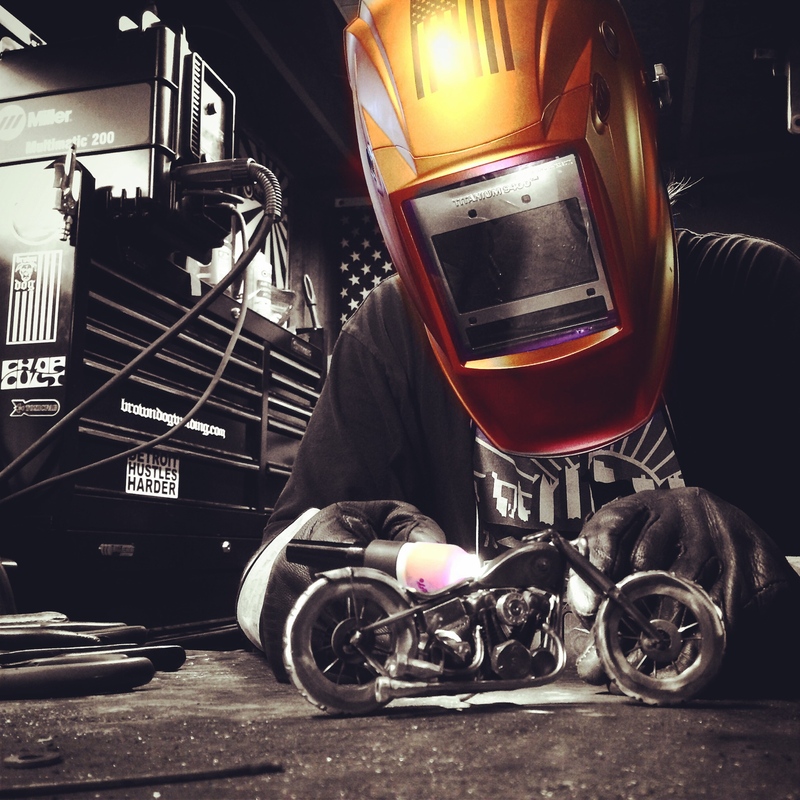 Do you continue to practice welding and also other techniques? I absolutely love welding. About four years ago, I stopped using the art as an excuse to weld and decided that I had to take the art itself more seriously. Rather than just using it as an outlet for my welding. On the other hand, I have welding skills and work on a small scale. It takes a lot of practice and experience and enables me to create things which are maybe not so easy for other people to do. Whether it's the art or my fabrication, I am always welding and I'll always be doing that as long as I am physically able. "I'm always welding. It's what I love doing"
How do you create all the different parts? It's like creating your own model kit and then assembling it with welding. How does that work? I pretty much just put it together. 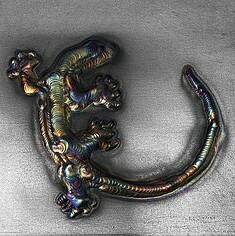 To bond similar metals, I use a filler called Silicon Bronze to attach copper or bronze or galvanize for my sculptures. I don't paint. All the colours I get are either from different types of metal or different fillers, or from the heat that goes into the metal. That's where I like to get my colour from. I am looking now at the blue Chrysler Desoto. Was that original paint? Yes that was original paint from an old electrical box that I had sitting in my shop. I welded it to the body and then clear coated it. During the melting process, can it get damaged? It can, and that was actually the first time I tried that technique. I did that car for Jonathan Ward. The underneath of his car was all new and modern but the body was purposely old and patina'd. I wanted to capture those aesthetics, so I decided to try using pieces that were already patina'd and painted. I used very little heat and strategically placed my weld, to not burn off too much of the metal. That was a learning curve. You can see the rear fenders are a little bit burned because I tried welding all the way around. Even though it didn't turn out exactly as I had it in my head, I still think it looked cool with the piece. So I left it at that. Each time I learn a bit more about how to keep as much of the original paint as possible. It's like an assemblage but I like to do it by welding instead of gluing or screwing something together. What is the Lizard you made? That's Johnathon Wards' logo. The Desoto, the 48 Buick and the Toyota are all vehicles that Johnathon built at his shop in California which is ICON and that lizard is his company logo. So I added it. What is that other art on your website? I saw a couple of skulls. I call it tattooed metal. I've done that forever. I just use the weld to build up designs. The more I do it, the better I get at controlling the heat to manipulate the colours. So by controlling the heat, you can get different colours. Do you do that with your torch? Yes. Basically the colours come from the temperature and composition of the metal when it hits the atmosphere. That dictates what the colour is. When you are welding with the torch, you have a gas coverage which protects the molten metal from the atmosphere. I don't have anything fancy. I got an anvil last year which was my latest and greatest purchase. I've got a 133 pound Trenton handle which was made in 1900. I'm sponsored by Miller Electrics and we have a pretty good relationship. I do a lot of video's with them and those are the welding machines which I use. I also use a lot of hammers and vices and things like that. Cut off wheels. Nothing too fancy. It's nice to have an endorsement such as Miller. Definitely. What is so cool is that I've worked for them for a few years now and they've stuck by me with my health issues. Everyone in the company is so passionate about what they do. I go to shows and I talk to the engineers and we talk welding and private development. It's cool to deal with a company who are so passionate about what they do. Like I'm passionate about what I do. It's the same with my other friends who are hot rod builders and artists and welders. I am drawn to people who are passionate about what they do. Where does your name Brown Dog Welding come from? When I started at Chrysler in 2001, we adopted a little pit bull boxer mix from a local shelter and he was actually born on the day I first started to weld. He was a little brown dog and that is where the name came from. He just passed away last February and he was our one and only kid. People ask me if I have ever done a sculpture of him and I haven't because I feel like all the pieces I do, have a little bit of his character and spirit in them. He had an old soul and was such a kindred spirit. Do you visit shows with your art? I do two shows a year. The Detroit Autorama which is local and I've become such good friends with all the artists who show there. It's a fun weekend and the last three years I have done SEMA in Las Vegas which is the largest trade show in the world. Two years ago, I was one of four artists invited and this year I was one of seven. So it's a select group and it's an awesome show. Shows are a lot of work. I don't tend to do too many of them. When I am healthy, I would rather be out in my garage working. I sell almost everything on line but I have fun attending shows and in the future I would like to do more exotic ones like in Australia, Japan and maybe one or two in Europe. I want to do it for the experience more than anything. Do you get new inspiration at those places? Oh definitely. I don't usually have too much of a problem with inspiration. I could live to be 300 years old and never have the time to do all the idea's I have in my head. I just love the camaraderie of being around other fabricators and artists. It's the atmosphere. I love going to the hot rod shows. Some of the vehicles transcend more than just transportation. They become art in themselves. I've met so many good people while travelling and going to those shows. 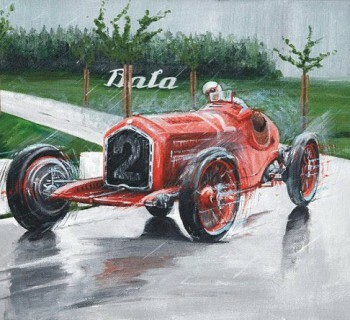 Is it important for you to meet other automotive artists? Yes. A couple of my really good friends Max Grundy and Ed Tillrock, who I met in Detroit in 2010 when I had just started my business, took me under their wing. I consider them both as mentors and they've helped me a lot in my development as an artist. It's nice having guys who have been doing this, to be a sounding board and give advice. David Lozeau is another artist who is a good friend and who has helped me figure out how to do my art as a business. That is probably the most difficult part for me. Creating the art is where I relax and have fun but dealing with the business side of things, is not second nature to me. I saw your Triumph on Etsy and was surprised at how low the price was because it's awesome! The pricing is the most difficult thing. Johnathon Ward has been a huge boost for me. He told me to double my prices. It's one of those things where you don't want to jump up too quickly and not have the market be there. That's the goal, to create your brand. The people are out there. You just have to get the word to the people. That's the trick. It sounds strange but you also need people who dislike your work, to create some emotion. Yes, and I have a hard time with that because I've always wanted everyone to like me and I've always felt that I needed to defend myself all the time. My wife is actually one of those people who has the attitude that you need to let things go and keep doing what you are doing and not worry about everything else. I will stand up for myself if anyone attacks my integrity but basically my work speaks for itself. And it certainly does! See more of Josh's amazing work on his website and visit his Facebook.